1) each set of points will need a method of switching the polarity to its Vee section (see diagrams in earlier blogs). 2) the recommended method of doing this is to use a points motor with either a built-in (a la Gaugemaster) or supplementary (a la PECO) polarity switch. 3) have rejected both Gaugemaster and PECO motors because they are solenoids and seem to me intrinsically unreliable (see earlier blog where a solenoid motor was tested, and melted). 4) have ordered a couple of Tortoise points motors. They are not solenoid based and are supposed to be very reliable. 5) have also considered designing and making my own mechanical polarity switch which will activate when the points are changed manually ie without the presence of a motor. 6) will experiment on my test-bed track with both 4) and 5). 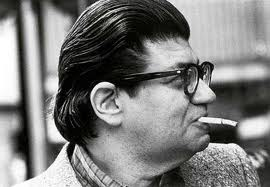 Perhaps comparisons are invidious, but Feldman is far and away my favourite avant garde composer. He operated in the last half of the 20th Century and died in the 1990s. 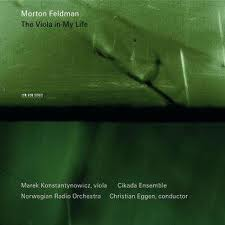 The Viola in My Life is sensational. The best words that I can come up with to describe the three movements are: soothing; spare; haunting; intellectual; melodic; spiritual and, dare I say it, "achingly beautiful". Also, although American, he looks French and would be an ideal visitor to the world of my model railway. At the risk of getting a slap :) - Have you considered not using point motors and simply doing the job with the "great hand from the sky". Alternatively, you could try using rods. I was mightily confused about all this polarity changing business and thought/guessed that using points motors might integrally deal with that issue. Also, I felt that using the great hand was a bit of a cop-out while installing rods would simply be beyond me.